Charleston’s newest restaurant – The Block – is an epicurean’s dream come true with a deliciously enticing menu and a wine list that is extensive and well thought out. I had heard good things for years about the wine and food at The Block’s sister restaurant- Wine Valley – located in a shopping mall in Winfield, but I had never taken the time to drive to Putnam County to taste for myself. The wine list at the Block does feature some of the usual suspects such as steak house cabernets and big rich chardonnays, but what sets this establishment apart from any other restaurant in the state (except perhaps The Greenbrier) is the focus on wines that are really meant to be enjoyed with the eclectic menu of small plates and full entrees. Take, for example (as I did) the sampler appetizer that featured Marcona almonds, a crab cake, a quinoa-feta salad dollop, thinly sliced Genoa salami and Tzatziki (yogurt and cucumber dip) accompanied by toasted pita wedges. Talk about your opportunity to experiment with a whole host of wines! I chose Bisci Verdicchio from around the commune of Matelica in the Italian state of Marche. The verdicchio grown and vinted in this part of Italy is much superior to the wine made from the same grape grown closer to the Adriatic Sea. Those wines can be light and almost tasteless. The Matelica region is further inland and in a less fertile area which forces the verdicchio vines to work harder, and the resulting wine to be fuller and richer. The fact that owner Desislav (Des) Baklarov even found this verdicchio is testament to his impressive wine curiosity and knowledge. And, at $8 for a six-ounce glass, the wine is very reasonably priced. With almost 300 wines by the bottle to choose from and about 50 of them available by the glass, you will find wines from just about every major region on the planet. I know I did. Perusing the wine list, I almost fell out of my seat when I spied a Spanish red that is extremely hard to find locally and which was the perfect match for the meal I later chose. Most normal people select the menu item before looking for a wine to pair with it. Not yours truly. I look for a wine first and then figure out what I am going to eat. Hey, but I wasn’t finished. I could not resist choosing from among the many excellent selections of late-harvest and after dinner wines offered at The Block. Eventually, I chose an Alvear Amontillado Sherry. For those of you unfamiliar with anything but Harvey’s Bristol Crème, this lovely, caramel and nutty flavored, slightly sweet wine will open your palate to a whole new appreciation of Sherry. The wine list also boasts a number of ports and other late harvest wines to put a nice cap to your meal at the Block. For a new restaurant opened for just two days prior to my visit, I was shocked at the quality of the food and, particularly, the depth and breadth of the very impressive wine list. Visit The Block at the Corner of Capitol and Quarrier Streets in downtown Charleston. 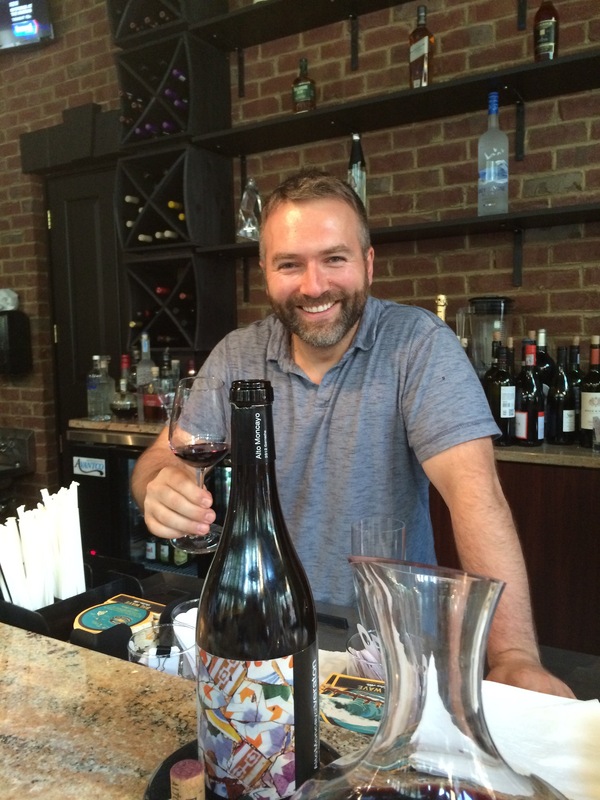 If you love good wine and food, you might try a sip off the old Block!